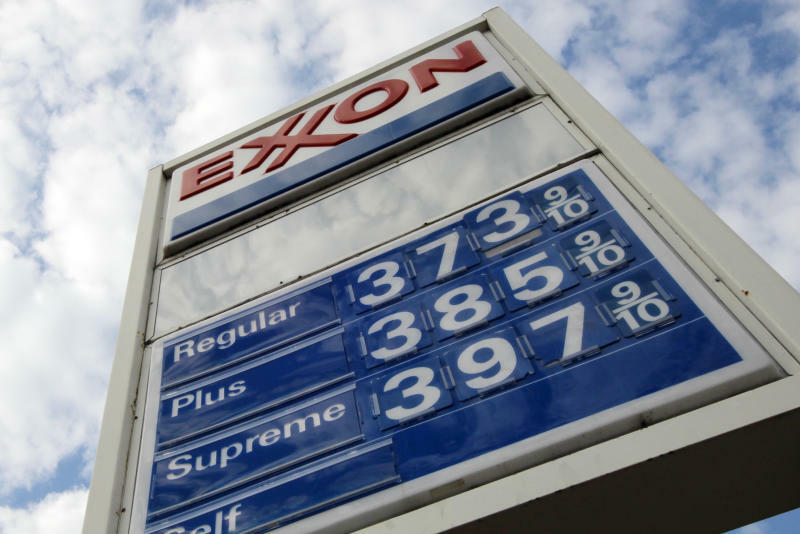 DALLAS (AP) -- Exxon Mobil Corp. earned nearly $8 billion in the third quarter, but that was down 18 percent as the company made a lot less money refining oil into fuel. Although Exxon increased oil and gas production slightly, it wasn't enough to offset weakness in refining, which also hurt results at other major oil companies. Refining margins have collapsed this year. An easing of transportation bottlenecks has boosted the price of some North American crude oil. Meanwhile, gasoline prices have fallen because of ample supply and moderate demand. Exxon, the biggest U.S. oil and gas company, said Thursday that third-quarter net income was $7.87 billion, or $1.79 per share. That compared with $9.57 billion, or $2.09 per share, a year earlier. Revenue dipped 2 percent to $112.37 billion. It was Exxon's second-smallest quarterly profit since mid-2010, beating only this year's second-quarter earnings of $6.86 billion. Still, the results narrowly beat expectations. Analysts forecast profit of $1.77 per share on revenue of $107.39 billion, according to a FactSet survey. Earnings at Exxon's so-called upstream business of finding and drilling for oil and gas improved, rising $740 million to $6.7 billion. Production increased 1.5 percent because of new projects and fewer maintenance interruptions. But profits plunged in the "downstream" business of refining oil and selling the finished products such as gasoline and diesel fuel. That segment earned $592 million, down $2.6 billion from its record third quarter of 2012. Exxon said overcapacity in the refining industry has cut into margins. Profit from making chemicals rose $235 million to more than $1 billion. Exxon has been criticized for slow growth or even declines in oil and gas production. New projects take years to develop. At the same time, oil and gas flows at slower rates in maturing fields. The company has several huge projects in the works, but their payoff isn't expected until 2015 and beyond. The company increased capital and exploration spending by 15 percent compared with a year earlier. Chairman and CEO Rex Tillerson said Exxon was making progress at tapping opportunities. "We maintain a long-term perspective on our business with a relentless focus on operational excellence and disciplined investing," Tillerson said in a statement. Exxon spent $3 billion buying back 34 million shares during the third quarter, and expects similar spending in the fourth quarter. Buybacks boost the value of remaining shares, and Exxon had been more aggressive earlier this year, spending $5 billion on buybacks in the first quarter and $4 billion in the second. Fadel Gheit, an analyst with Oppenheimer, said the promise to keep buybacks steady in the fourth quarter "saved the day for the stock." Shares of the Irving, Texas-based company rose $1.48 to $90.29 in afternoon trading. At that level, they were up 4 percent this year. The company has spent more than $20 billion this year on share buybacks and dividends, which Gheit said has convinced some investors to hold on to the stock despite slow appreciation.